The Cincinnati Kid is one of the greatest movies of all time. Period. Although released back in 1965, the movie deals with a topic that is relevant in the 21st century. It is about a man’s attempt to prove himself to the world and to battle against all the odds to achieve success. It is about a young man trying to make his way in a world where the odds are stacked against him. Eric Stoner is an up-and-coming poker player in New Orleans, and after he hears that Lancey Howard, a veteran of the game, is in town, he wants to take him on full-on. Stoner is hugely ambitious and wants to break out of his shell as ‘The Kid’ and metamorphose into ‘The Man’, who until now is Howard. A game is eventually arranged between the two. The plot of the movie is simple enough, but what makes this film so special is that the depth of the acting and the message it sends out. It is about the new replacing the old, about someone succeeding through determination. Steve McQueen is the lead actor in the movie, and the American’s performance was flawless. It is hard to imagine anyone but him play the role of Eric Stoner, The Kid. The performance of Edward G. Robinson was just as good. 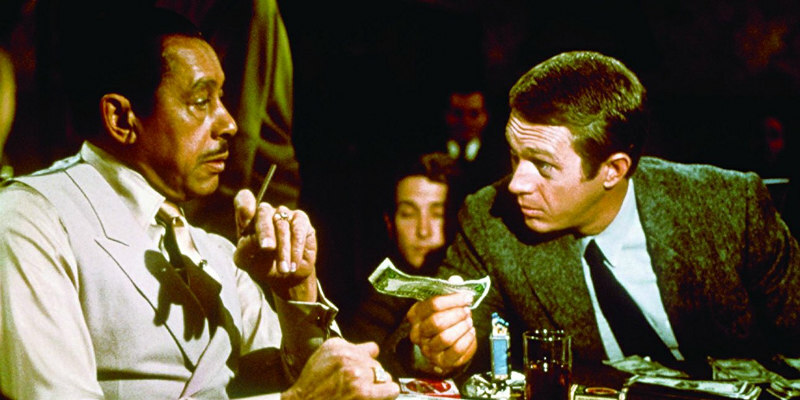 Until The Cincinnati Kid, Robinson had been involved mainly in comedy movies, but in this film, he took on a more serious role with a lot more depth in character. Robinson played the role of Lancey Howard, The Man, to perfection. The way the Little Caesar and Key Largo star acted during the game scenes are a marvel to behold. The Cincinnati Kid is one of the first and most well-known movies which ushered in the era of using poker on the big screen. Since the release and success of the movie back in 1965, there have been a number of superb films which had the game of poker as a pivot. Movies such as Rounders (1998), The Grand (2007), Shade (2003), Deal (2008) and Maverick (1994) are just some of the films who have made poker so glamourous and fun. Such films have shown that playing poker is not as hard or daunting as it is often made out to be. For example, Texas hold‘em is supposed to be one of the most difficult variations of the poker game, but it can be mastered in just a few easy steps. All you need to have is a bit of patience and willingness to learn, and you can become ‘The Man’ in no time. The Cincinnati Kid was a trendsetter, and if you have not watched it yet, then it is high time that you do. Even if you are not a poker player or not into ‘old movies’, this film is a must-watch that could change the way you look at the world and could give you a fair good idea of how hard it was to break through in the 1950s and the 1960s.